Britain is blessed with some seriously world-class coastline, and arguably a good chunk of it can be found in the Southwest of England. From personal experience, I can also heartily recommend the coast around St. Abbs Head in the Scottish Borders. Lisabet and I have been there before, two years ago in fact, so we visited the area again recently whilst staying for a week based in Aberlady, 20-miles east of Edinburgh. The composition above is of the delightfully named Pettico Wick Bay, which opens out this view as you start descending down the northern side of St. Abbs Head. The geology in these cliffs is absolutely fascinating, all twisted and slanted at odd angles and irregular shapes. The cows grazing on the leftmost clifftop with a small party of people resting below give you an indication of the scale of this place. Filters: Hoya polariser, LEE 2-stop medium and 2-stop hard GND filters. There’s a lot of evidence of prehistoric volcanic activity around Southeastern Scotland, such as the various “Laws” inland (law is the Lowland Scots word for a solitary hill), and the prominent craggy islands dotted about the Firth of Forth, such as Bass Rock. The various sea stacks are also a strong indicator, such as the one in the composition above, which sits alone surrounded by silky sand at North Berwick beach. In the distance, Bass Rock glows brilliantly, it’s bright white surface largely a result of hundreds of years of gannet guano. Filters: Hoya polariser and LEE 2-stop hard GND filter. There is a certain aura about Edinburgh that can at times be overwhelming. I think it’s the sense of history combined with the scale of the city; the feeling that you are a small and transient bypasser, a mere echo of a ghost compared to the sheer permanence of the city. The architecture of Edinburgh enhances this sensation and I couldn’t help but gawk in childlike wonder at all the buildings. 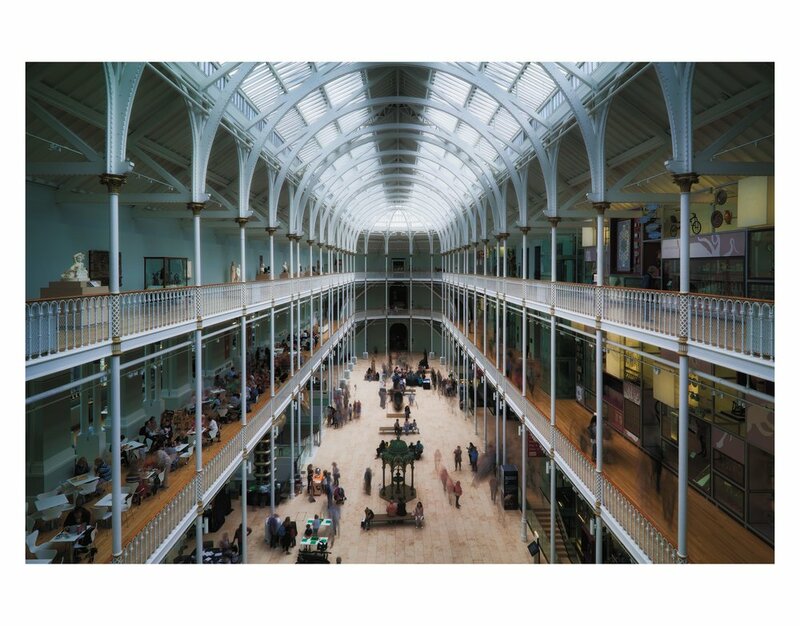 The National Museum of Scotland invokes a similar feeling of awe in me, especially when you explore the Grand Gallery, pictured in the composition above. I tried to convey both the sense of timelessness of this place and transient human existence by shooting multiple, longer exposures, allowing the silhouettes of people to ghost and blur. My obsession with landscape photography has transformed me into something of an amateur geologist. Guys… I find rocks fascinating. This is useful because the British Isles, geologically speaking, is really bloody old so there’s plenty of opportunities to discover and learn. A favourite spot of ours in Southeast Scotland is Dunbar, a historical town that’s seen its fair share of action in centuries gone, but nowadays finds itself a thriving destination for working commuters to Edinburgh. Dunbar’s coast displays wonderful variety, from towering volcanic sea stacks to wavy sandstone beds. The composition above shows layered cross-bedding in red sandstone. The red fissures are iron-rich “cement” left by ancient roots that were growing in this rock millions of years ago. Yellowcraig beach. This was a new place for us. It sits roughly equidistant between North Berwick and Aberlady, our base for the week. 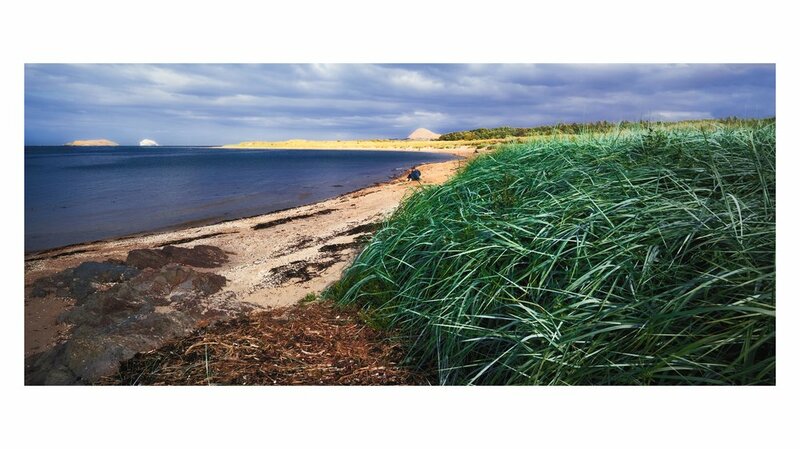 Yellowcraig is known for its long and soft beach, its pine forest that shelters the bay, and the abundance of dune grasses. Looking east from Yellowcraig it’s possible to see not just Bass Rock (which is visible from a lot of the East Lothian coastline) but also Craigleith—a Firth of Forth island to the far left in this photo—and North Berwick Law, the conical hill that rises above its town. Thick, stormy clouds were brewing towards the East when I took this photo, but the setting sun was still shining brightly behind me, making the islands and North Berwick Law glow like beacons in the dark. Sometimes, a scene looks so good to the human eye but can’t be translated into a simplified composition. In these cases, such as in the photo above—shot from the entrance of Animal World in the National Museum of Scotland—the best you can do is shoot the “chaos” of the scene then let the viewer see what they want to see in the final photo. With that in mind, enjoy the “chaos” of Animal World and have a wander around the photo. If there is one thing that Dunbar is famous for it’s for being the birthplace of John Muir, the world-famous Scottish-American naturalist, author, environmental philosopher, glaciologist, and early advocate for the preservation of wilderness in the United States. Tributes to John Muir can be found all around East Lothian, particularly the John Muir Way: a 130-mile continuous long distance route, running from Helensburgh, Argyll and Bute in the west to Dunbar, East Lothian. If you take the Way west from Dunbar you end up at Belhaven Beach, pictured in the composition above. In modern times the beach has become well-known in photography circles for its bridge, which at high tide seems to lead to nowhere. I found this composition of the Biel Water river cutting through the sands of Belhaven Beach, its last journey through land before joining the Firth of Forth. The deep, dark sea below, the blazing, bright sun above. In between, deep cuts into the cliffs of St. Abbs Head form these “arms” or “tongues” stretching out into the sea, a result of millennia of waves, storms, and changing temperatures. There’s something about being on the edge of land that I find exhilarating. A tangible threshold, or sense of finality about the scene. “From here, no further.” The above is a composition I took looking southwards from St. Abbs Head towards its namesake village and the coast beyond to the Scottish Borders. The sun managed to find a way through the cloud cover and really pull out the texture and definition in the cliffs. A variant of composition no. 2 above. This is a solitary sea stack found on North Berwick beach, formed from dark igneous rock and covered in mustard yellow lichen and moss, giving it that great colour contrast. In the distance, Bass Rock takes the full brunt of the setting sun. A polariser was used to remove the glare from the water, allowing me to see underneath the surface and extend my exposure time too. The Grand Gallery in the National Museum of Scotland. I couldn’t resist the geometry presented to me when wandering around this magnificent room, so I set up for a composition aiming to align all the elements as centered as possible. I love the soft light streaming down from the long sky light, creating soft shadows and dreamy highlights everywhere. Incidentally, the staff at the National Museum of Scotland are chill. Just head to the main entrance and ask the reception staff for a photography pass. They’re totally free. Around the coast of Dunbar I found this sculpted and wavey red sandstone that had formed a tiny “harbour” full of smooth stones and pebbles. Apart from digging the shapes and lines of this composition, I also shot the image for its colour contrast between the red sandstone and the more cyan tones of the pebbles. Scenes like this remind me: not everything has to be a grand vista. A more “traditional” landscape composition, shot merely a ruler away from the foreground rocks. Again I was primarily attracted to this scene because of the colour contrast: blue sky and water against ochre/yellow rocks and lichen, but also I enjoyed the symmetry between the two “islands” in the distance reflected in the two yellow crags of the nearby boulders. This was shot at Yellowcraig beach. I can see why it’s called that. As an aside, what looks like two islands in the distance is actually just one: Fidra, the name coming from Old Norse meaning “feather island”, probably referring to the significant colonies of seabirds living there. The island is basically two craggy hills connected by a low isthmus. Filters: Hoya polariser and a LEE 2-stop hard GND filter. If only a photo could convey to you, the viewer, the sound of thousands of gulls and gannets that make the cliffs of St. Abbs Head their home. It is immense. And oddly directional, too. If you’re wandering around the Head, away from the cliffs, all you can hear is the wind, sea, and maybe a few people. But as soon as you get near the cliff edges, the wall of sound hits you. It really feels like you’re gazing into a city of seabirds. There are seemingly endless compositions that can be found around St. Abbs Head. This one I shot heading north along the clifftops, looking down a narrow gully with wildflowers everywhere, sheer cliffs, gnarly sea stacks, and hazy clouds stretching into forever. A simple composition of Biel Water river cutting through Belhaven beach to join the Firth of Forth. In the distance is, yes you guessed it, Bass Rock. It’s probably the most conspicuous part of the East Lothian horizon. I think I’d like to check out the island properly one day. Just gotta be prepared to be covered in guano. Looking down from the top floor of Animal World in the National Museum of Scotland. Perhaps a little less busy than composition no. 6 above, which was taken from the entrance, but nevertheless there’s a lot happening. Enjoy wandering around the “chaos” of this photo. Take your time. It’s hard to convey the size and presence of the cliffs of St. Abbs Head, unless you include references that people can relate to. Between the red sea stack on the left and the green cliff on the right you can make out the tiny shape of a tourist boat. Hopefully that’ll help place you in the scene and give you a sense of scale. Also, if you were to zoom in on the red sea stack, you can pick out the white dots dotted all over the cliff. Those are gulls and gannets. This composition was taken from the roof terrace of the National Museum of Scotland. Excellent views of Edinburgh can obtained from here, especially the view towards Edinburgh Castle. I opted for this more unusual composition looking towards Arthur’s Seat and beyond. The approach to St. Abbs Head lighthouse. It was established in 1862 largely as a result of the sinking of the Martello on Carr Rock. The lighthouse also includes a foghorn, built in 1876, and was Scotland’s first audible fog signal. The lighthouse became fully automated in 1993. Can you imagine the solitude of having to live and work in the lighthouse here? I set up for this composition in even light conditions due to the overcast sky but as soon as I started shooting sunlight was “scanning” across St. Abbs Head, highlighting individual elements in my composition. I waited for the light to reach the cliff face then took my shot. I took a few different compositions from this spot, but this particular frame ended up being my favourite. Filters: Hoya polariser and a LEE 2-stop medium GND filter. The Roof Terrace on top of the National Museum of Scotland provides you with a full 360° view of the city of Edinburgh. “Spectacular” doesn't even cut it. But getting compositions from up here can actually prove quite tricky, and the reason is because the terrace is fenced off by 3ft-deep walls that have a variety of Scottish flora growing for educational purposes. I found this small gap in the wall that gave me a good long view of the city and the spire of St. Giles’ Cathedral. This composition struck me because of the contrast between the modern architecture of the National Museum of Scotland and the ancient architecture of Edinburgh Castle. Edinburgh Castle is a wonderous spectacle. It sits atop a 140m/460ft tall ancient volcanic plug called—appropriately—Castle Rock. The crag is made of super-hard dolerite, which resisted glaciation and erosion over millennia. There’s been human occupation on the rock since the 2nd century AD, but the castle itself has been there since the 12th century.